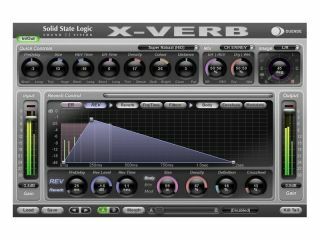 X-Verb is just one of the plug-ins that's currently exclusive to Duende hardware owners. Solid State Logic has admitted that it's working on Duende Native, a new platform that will apparently see its Duende powered plug-ins made available to anyone with a DAW capable of hosting them. The news had leaked, so the company decided to confirm it. This is a significant move from SSL, which currently offers its Duende hardware in both Mini (an external FireWire box) and PCIe formats. So why has it decided to let customers have a software only option in the future? Writing on the GearSlutz forum, an SSL representative says: "Computers are getting faster and faster. They're not going to stop getting faster either. Power is no longer a problem - even for those with three or four year old computers." He later continues: "So looking forwards at this we at SSL decided that unless you are in an absolute mission-critical application a native system is more than adequate for the job of making music. Rather than develop a new hardware platform for Duende we came to the conclusion that most people just wanted native plug-ins." This, of course, will be music to the ears of those who've always wanted genuine SSL plug-ins but haven't been prepared to buy (or able to afford) the Duende hardware. Whether the native processors will be exactly the same as the hardware-powered ones remains to be seen - beta testing is set to begin in 4-8 weeks, and SSL says it'll comment further then.